This decorative fruit basket is divided into 6 equal parts and filled with dried fruit and nuts. As a hostess gift or for condolence, this food basket will make anyone's day sweeter. Israelis and Middle Easterners are known for their love of nuts, and you can ease their cravings a bit with this elegant looking fruit basket. 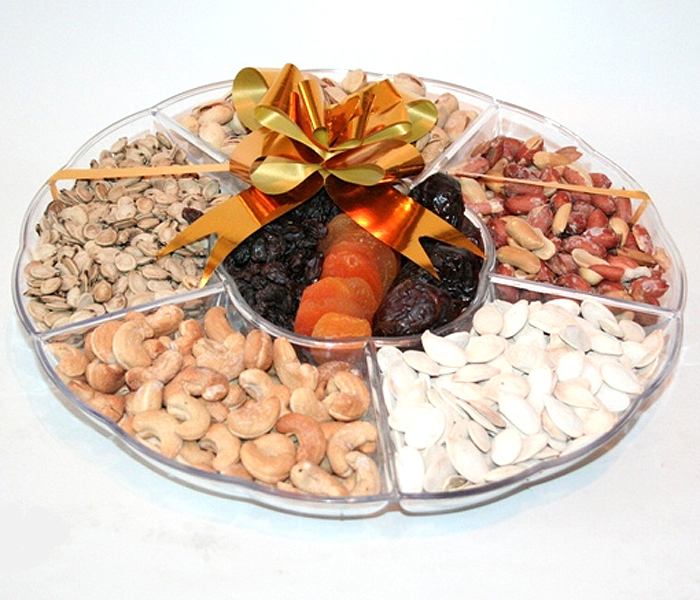 With five types of nuts circling various dried fruit, this food basket is a sure winner. The different kinds of nuts include watermelon seeds, pistachios, pumpkin seeds, cashews and peanuts, weighing about one hundred and fifty grams each (approximately 5.3 ounces), while the dried fruit are neatly lined up in the center of the circle and consist of dried apricots, raisins and prunes, weighing about two hundred grams (approximately 7 ounces) each. Though none of the above fruits are from the seven species of the land of Israel (namely wheat, barley, grapes, pomegranate, date, olive and fig), there is a special quality for anything grown there. Once thought to have been barren of good crops, Israel now grows a wealth of different fruits like no others and its produce is known worldwide, ranging from dates to oranges. The wine made in wineries spread around the country, such as Gush Etzion, Yatir and the Galilee, are famous, too. The fruits making up this food basket was grown in Israel and tended with care, making this a unique and ideal gourmet gift basket, suited for any occasion. Whether used as a condolence gift or a hostess thank-you present, this fruit gift will surely be appreciated. The Israeli designer who thought of this specialty food gift basket has many more such thoughtful gifts for different occasions. Be sure to check out more of Esti B's products for a special, unique gift for the ones you love.